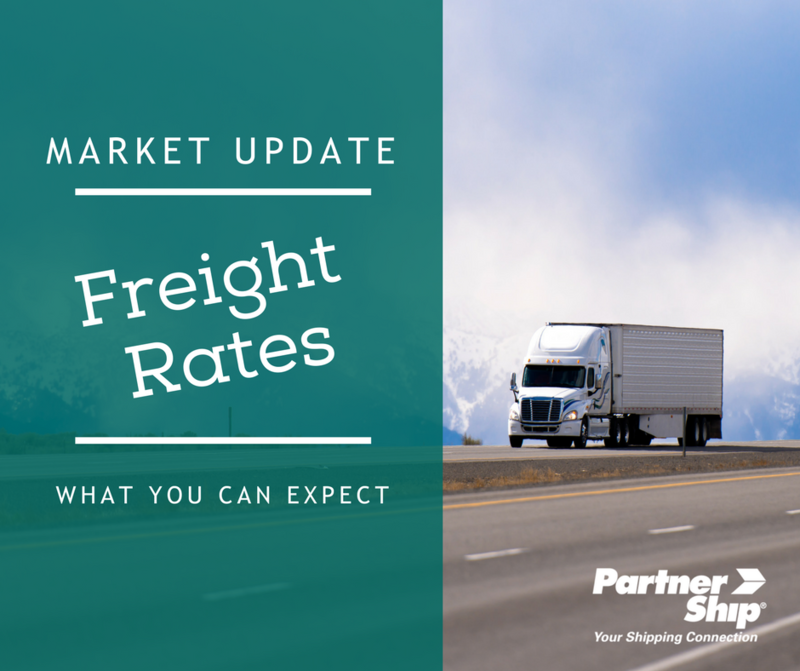 If you’ve been experiencing sticker shock from unpredictable freight rates lately, you’re not alone. Shippers are seeing a lot of volatility in the truckload and LTL market, with no end in sight. 2017 ended with tightened capacity and record rates. By December, the average van rate was $2.11 per mile (DAT) – an all time high. The load-to-truck ratio was also breaking records at the end of the year, with 9 load postings for every truck posting in December. Coming off of a record high December, capacity continues to be tight in January – particularly with reefers since they’re needed to keep freight from freezing in the coldest parts of the country. DAT reported that the national load-to-truck ratio at the beginning of the year was the highest ever recorded at 25.2 reefer loads per truck. During which, the reefer rate was at a high $2.71/mile. Van rates have also been breaking records. According to DAT, they were at $2.30/mile on January 6. So what can shippers expect going forward? Let’s look at the trends. We saw a bit of a recession in 2015 and 2016 with rates and load-to-truck ratios declining, but that appears to be over. Rates climbed throughout 2017 and we can continue to expect increases in 2018. Overall, the U.S. economy is healthy right now and is growing, increasing freight demand. In contrast, the trucking industry is dealing with the aftermath of the ELD (electronic logging devices) mandate. Not only do they need more drivers and more equipment on the road to handle the same amount of freight, but they are also contending with a long running driver shortage. All of this equals tightened capacity, which is becoming the new normal in the industry. Recent weather events have been driving up rates as well. Areas of the U.S. that don’t typically experience extreme cold or snow have been hit by treacherous weather that has led to dangerous conditions including low visibility and icy roads. In a tight capacity market, these conditions drive up rates even more. In February we can expect to see capacity loosen some (barring any winter storms or other troublesome events), as this is typically the slowest time of year for freight. However, you’re likely to see higher rates than you have in years past, because of the long-term trends. In April, drivers not complying with the ELD mandate will be put out of service. Up until then, inspectors and roadside enforcement personnel are simply documenting and issuing citations if a truck isn’t equipped with the required device. As a result, we may see some ripple effects. There could be fleets that have held out or hoped to fly under the radar until April. There could also be another wave of trucking companies exiting the market, which will leave a void in the already tight market. Now it’s more important than ever to find ways to mitigate the impact of this tightened capacity. Plan ahead so you can be flexible. Providing more lead time and giving your carrier a longer pickup window rather than a specific time can lessen the strain on its network. Planning ahead can also help you shift to more committed freight and away from the spot market. The spot market is more sensitive to disruptions and subject to reactionary pricing spikes. Luckily you don’t have to navigate the freight market alone. When you work with PartnerShip, you benefit from our large network of carrier partners and our shipping expertise. We help you ship smarter with competitive rates and reliable service. Get a quote today!